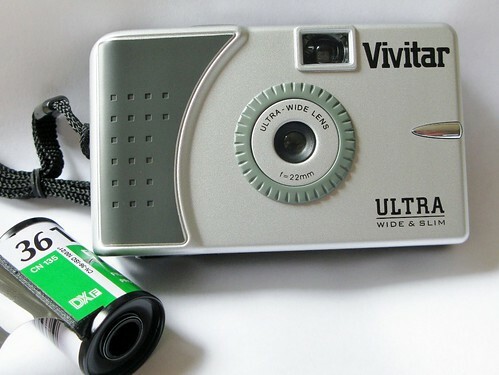 The Vivitar Ultra Wide and Slim is an all-plastic, "focus-free" 35mm camera marketed by Vivitar. It was manufactured in China by Sunpet of Hong Kong, and has no adjustments for exposure and no flash, limiting its use to daylight scenes. Two things set it apart from the typical low-cost plastic 35mm trashcam: First, it has an exceptionally wide-angle lens, nominally 22mm in focal length with a aperture of f/11. The minimum focus distance is at 1.5m. The shutter is single speed at 1/125. 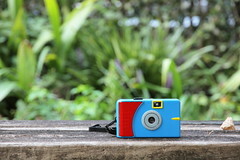 Secondly, true to the name "slim," the camera is physically small and easily pocketable. The film is advanced with a wheel using the left hand thumb. A counter is on the top of the body. Rewinding the film involves releasing the film spool on the base of the camera and operating the film rewind crank. When rewinding the film back into the canister the exposure counter is decreased. The lens in this camera has two elements, giving better-than-expected sharpness. However the camera still gives quite noticeable vignetting in the corners of the frame. For some users this is an appealing feature, as it creates some of the look of the cult favorite Lomo LC-A—but at a considerably cheaper cost. Some users have found the film advance to be prone to failure, however. 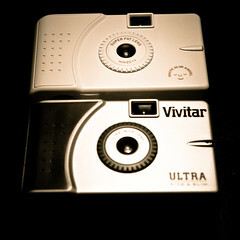 The original production of Vivitar Ultra Wide and Slim cameras seems to have ended; but a Japanese distributor called Powershovel marketed a camera series branded as SuperHeadz Wide and Slim. The cameras have been released with the names such as "White Slim Angel" and "Black Slim Devil" which are based on the same molds. Another rebranded version is the Eximus. ↑ The camera appears without Vivitar's branding in the Sunpet catalogue dated 2010 (in the PDF file properties). This page was last edited on 14 January 2019, at 22:42.